We are pleased to be exhibiting our innovative material handling solutions at booth #S3912a, April 8th-11th. 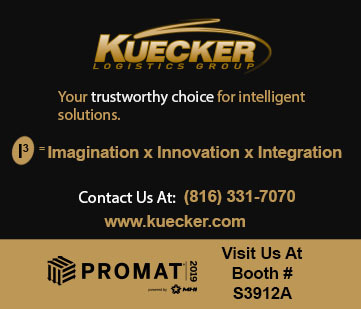 ProMat is where manufacturing and supply chain professionals come to find their X factor, that unknown quantity that will take their supply chain to the next level of success. We will be demonstrating several new exciting products this year in our booth, #S3912a. To start, we will have a Virtual Reality (VR) system set up so attendees can virtually walk through one of our latest Distribution Center designs. There will also be multiple live equipment demonstrations including an OTTO 100 self-driving vehicle running in the booth, along with an AutoStore Black Line robot and RightHand automated picking solutions. Let us demonstrate how we can effectively automate your distribution and picking requirements and provide the best attainable throughput and efficiency for your distribution center. For more information about Kuecker Logistics Group, please feel free to contact Mr. Jim Kuecker at 816-666-8404 or visit www.kuecker.com.